351 Water Street Parking 351 Water Street is the first new office building on Water Street in more than 25 years. It’s the first building in Newfoundland and Labrador to be heated and cooled by sea water. And it’s the first to host a private sector juried art commission. 351 is a contemporary six-storey, 168,000 square foot office tower above prime retail and commercial space with a 445-car parkade which includes 245 public parking spaces. The building was designed to balance the old with the new; to reflect the heritage of Water Street while incorporating the most modern of technologies. 351 is the first building in Newfoundland and Labrador to be heated and cooled by sea water. 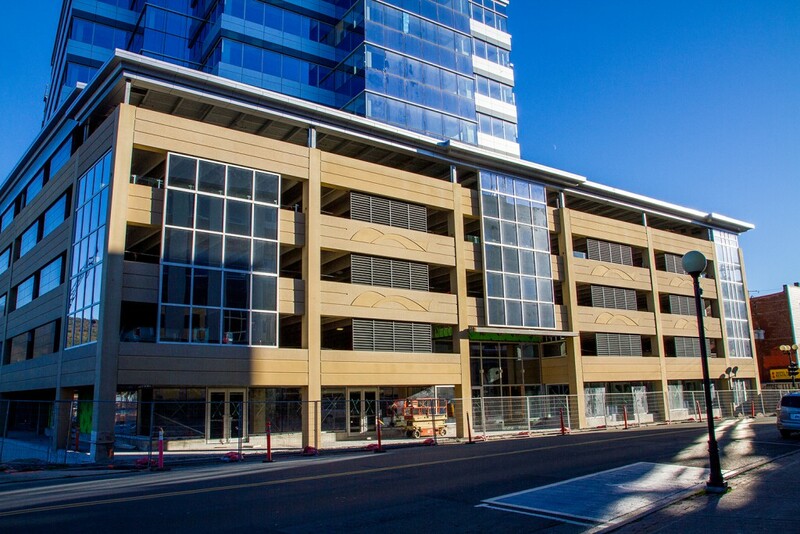 Based on an innovative system developed by East Port for their Purdy’s Wharf complex in Halifax, it uses the natural thermal energy of the tides that flow near the building to heat and cool the building. The big advantage of this, aside from the obvious environmental benefits, is that 351’s tenants have lower energy and operating costs. 351 has been designed to provide the most healthy and human environment possible. East Port hosted the first private sector juried art commission in Newfoundland and Labrador to create a piece of public art to be incorporated into 351. This piece, the Black Island Punt by Newfoundland artist, Will Gill, is on permanent display in the lobby of 351. The office tower of 351 is fully leased. Husky Energy was announced as the anchor tenant, on 22 January 2013, taking five of the six floors. On 26 February 2013, Subsea 7 was announced as being the tenant of the sixth floor. $15 – Daily max 6 a.m. – 6:00 p.m.
$10 – Nightly max 6 p.m. – 6:00 a.m. Located within steps of the St. John’s Harbour, it was inevitable that the development concept for 351 Water Street included using seawater as part of the plan for the building to be energy efficient and environmentally sustainable. Three drilled wells in the basement of the building connected to the building heat pump equipment, allow the use of the ground water that flows in and out underneath the building for both heating and cooling. Occupancy sensors in transient occupant areas, photo sensors in daylight areas with auto dimming, two air handling units per floor – one for perimeter zones, the other for interior – and demand control ventilation results in building systems that can target occupant levels and movement to respond only when and where necessary. The closed chilled water loop allows connection of tenant data center cooling equipment, and the rejected heat from the data centre is returned to the building loop for use in areas where heating is required. 351 Water Street is a 6-storey office building set on top of a 6-storey parking garage, so all office floors have the benefit of a ‘high-level’ view of downtown St. John’s and its working harbour. The office building was set back to maintain the height limits in the area, as well as to reduce shadowing at ground level. Visually light building materials make the building unobtrusive from Water Street, and blend with the scale and proportion of adjacent buildings. The 28,000 square foot floor plate and stepped curtain wall exterior provide maximum opportunity for daylighting and views, and tenants responded by designing open concept space, allowing the majority of their staff to enjoy these features, while concentrating closed offices, boardrooms and services around the core. Internal stairwells and restoration of an historic laneway has reconnected Water Street and Harbour Drive, and provided sheltered public spaces which can be used by customers of the retail services areas on Water Street. 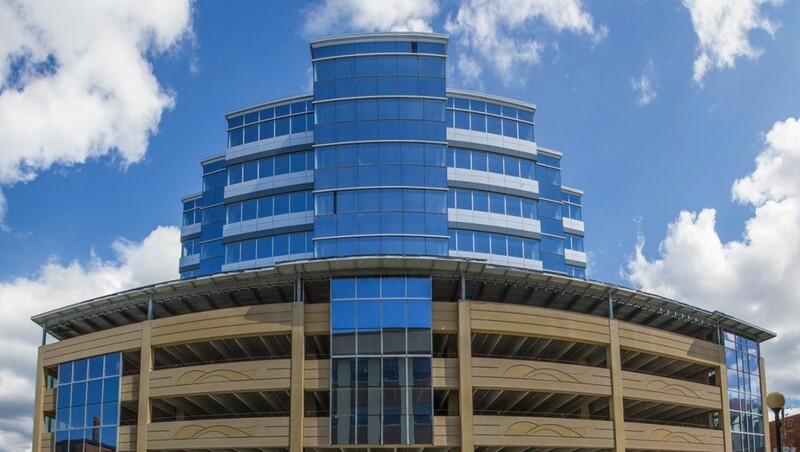 The parking garage provides on-site parking, including electric vehicle charging stations on every floor, and elevators connect the parking facility with the office floors. For those who prefer to bike or walk to work, showers, locker rooms and covered, secure, bike storage areas are provided within the building. Give us a call for further information, or to organize a tour if you are interested in learning more about the building.